Sarah P’s comments: For anyone interested in the international school librarian market ISS is hosting another hiring fair, this one after the height of the hiring season has concluded. This is an opportunity to gain a break-in position for those without the ‘A list’ attributes, namely international experience, school media certification on top of an MLIS (but you should be able to show you are working to obtain it), and/or being single or part of a teaching team. You must be a registered ISS candidate to attend so if you are interested you need to contact ISS ASAP because establishing a file can take time due to credentials and recommendations needing to be verified. Sarah P’s comments: Here is TIE’s list of recruiting fair dates for this year. If you are interested in pursuing this kind of library opportunity, I recommend you join The International Educator (they post jobs) and International School Reviews as well as read my book. Note: the fairs are moving earlier each year – the first is now in November! To register for a recruitment fair, please contact the sponsoring agency directly. We have provided links to their websites where you will find much more information about each event. Please be aware of deadlines for registration, and prepare as far ahead as possible. 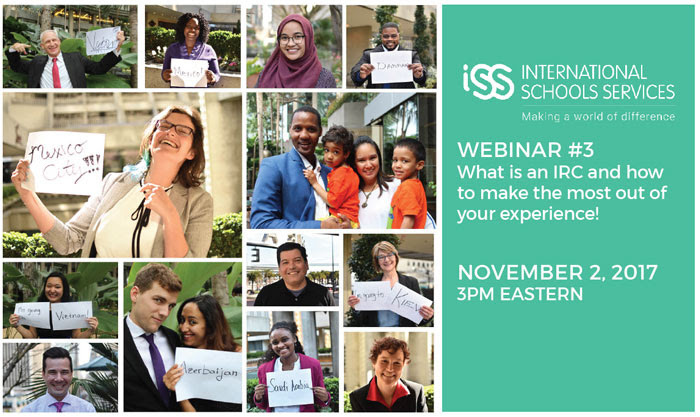 In recent months ISS has been working hard on your behalf to expand the opportunities available to you. Resulting from our efforts is a new partnership we are happy to announce today. This recruiting season ISS will be collaborating with AASSA to enhance your recruiting experience. ISS Candidates who register for the ISS IRC/Job Fair in Atlanta (Dec. 4-6) are also welcome to register and attend the AASSA Recruiting Fair in Atlanta (Dec. 1-4). AASSA (Association of American Schools in South America) was founded in 1977 to help increase understanding through international education and improve the quality of teaching and learning in Association schools. Attending the AASSA fair is optional! You will not have to have a recruiting file with AASSA to be able to attend their fair. The only requirement is that you have an active ISS recruiting file. Your active ISS recruiting file will be shared with AASSA for the duration of their recruiting event should you decide to register and attend. There will be no additional charge for registering and attending either event. This partnership is for the current recruiting season only, however, ISS may choose to continue it for future recruiting fairs. Please do not contact AASSA as all arrangements will come from us here at ISS. We will keep you informed as more information becomes available with regards to this partnership and the upcoming events in Atlanta.